The latest in a series of mini exhibitions from the archive of Orkney photographer Gunnie Moberg, is now on show at Orkney Library and Archive. ‘Three Stone Circles’ is part of the Gunnie Moberg Archive project, a two year project hosted by the Orkney that will see as many images as possible from Gunnie’s sizeable collection (over 11,000 transparencies) digitised, catalogued and made available online. The project, funded by The Heritage Lottery Fund, will also host events and opportunities for people to enjoy the images along the way. 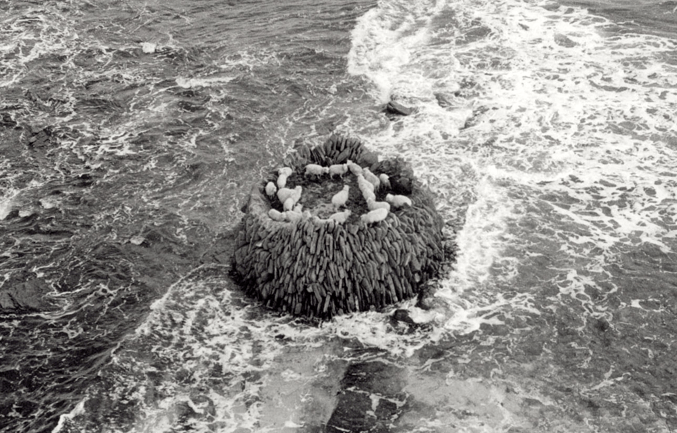 Three photographs in this latest exhibition: a sheep fort encompassed by the sea; a circular horse mill; and an aerial image of the Martello Tower at Hackness, show Gunnie Moberg’s attention to the shape of things. In this case she has focused on stone built structures – two are photographed from a bird’s eye view and one taken straight on. Gary Amos, the Orkney Library and Archive Manager, said: “To compliment the exhibition we have delved in to the Orkney Archive and looked for documents that hold something in common with the photographs. We did this by using search words in the archive catalogue, just as visitors to the archive can do. This way of working could have taken us in many directions with many possibilities for matches between image and text, art and document”.